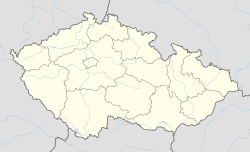 Slavičín (Czech pronunciation: [ˈslavɪtʃiːn]) is a town in the Zlín Region, Czech Republic. Notable people from the town include TV and radio presenter Lenny Trčková. Wikimedia Commons has media related to Slavičín. This Zlín Region location article is a stub. You can help Wikipedia by expanding it. This page was last edited on 2 November 2018, at 02:36 (UTC).